The Twins came together just a few months after winning its first World Series to quickly defend its title and reputation. 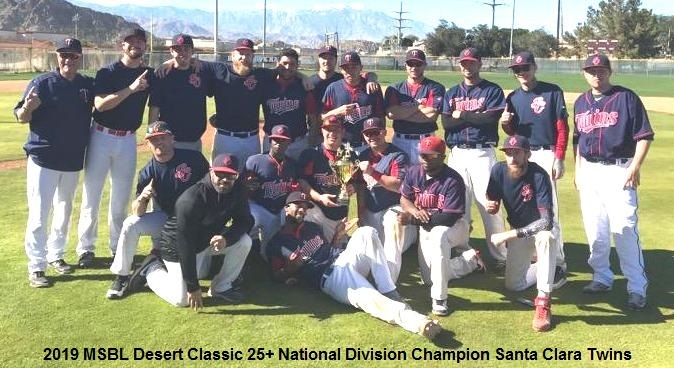 The weather in Palm Springs provided the perfect setting to play baseball but day one did not start out so hot for the Twins. The Twins ended up losing games one and two to the San Jose Marlins and San Jose Giants respectively. To lose both games to regional rivals was a bitter pill to swallow. Day one was highlighted with two strong pitching performances by Mike Miller and Ronnie Corona. Both starters kept the Twins in the games and gave them a chance to win. The batting order was just not clicking together that day. The Twins where not getting a lot of hits and when there was opportunity to do damage the bats stayed silent. The Twins did a complete 180 on day two of the tournament. With their backs against the wall the Twins had to win both games and hope some of the other games would result in a cluster of 2-2 teams. That is exactly what happened. The morning game against the San Gabriel Brewers was dominated by pitcher Jared Dumont. Dumont threw a one run complete game. The Twins bats started to wake up that morning as well. Scoring a total of two runs in their first two games, the Twins put five runs in game three and took that momentum into the final game of the round robin against the San Diego A’s. Both teams needed to win the make it to the finals against the San Jose Giants. The rematch of the A’s and Twins was a controversial affair. The teams met in the MSBL World Series last October when the game ended up being a forfeit in the Twins favor. The A’s were hungry for revenge and almost got it. The game went back and forth through the fifth inning ending up with the A’s leading 6-5. The score would remain 6-5 until the bottom of the ninth with two outs. With runners on first and third the Twins Derek Carter came up with a loud 2-run double off of the wall to put the Twins up for good. With a couple more timely hits the Twins end up winning 9-6. Michael Monelo pitched the final 4 2/3 innings of shutout relief. The final pitted the Twins against the Giants. These two teams come out of the same division in the San Jose MSBL. They were no strangers to facing each other with the stakes on the line. They battled in the semifinals of the same tournament the year before with the Giants coming out on top. They also faced each other in a 3-game league championship series last September with the Twins coming out on top to win the Dunn Division. The Twins would start Wesley Tramble on the mound who had won both games against the Giants in the league championship series. Tramble would go on the make a quality start going six innings and giving up two runs. It looked like it might not be enough with the Twins trailing 2-1 in the eighth. With Mike Martin and Derek Carter both getting on base to lead off the eighth, the Twins hottest hitter, Travon Jackson, came up and delivered a clutch 2-run double. The Twins would end up adding an insurance run and won the game 4-2. GM Kyle Madej put together arguably one of the most talented rosters the Twins have ever had and ended up melding just in time to forge a comeback and pave the way for a most memorable tournament experience.